Woking's flagship library is Surrey’s largest and busiest library with a clear vision for the facilities, aesthetics and visitor experience. The client required a modern and comfortable space that provided an interactive, stimulating environment and an exceptional visitor experience for the whole community. The quick choice section leads visitors into the library from the entrance. This section quickly introduces the latest stock and gives a clear line of sight through the library. Bright accent colours have been used throughout the building to define areas and create a feeling of warmth. Modern bookshop style shelving complements the high quality stylish furniture and creates a dynamic environment. 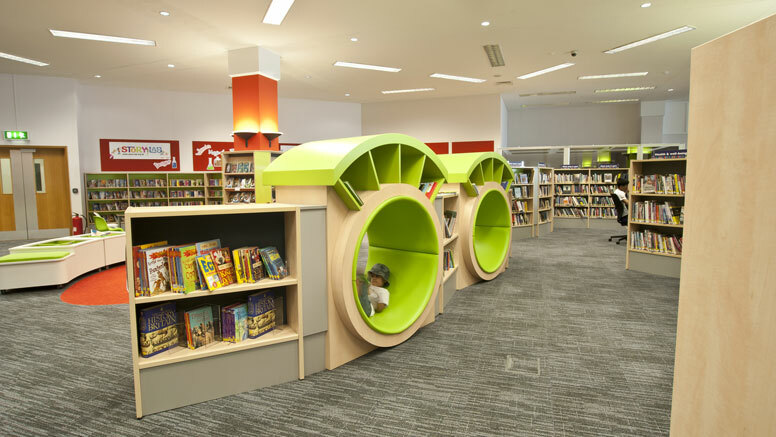 Particular attention has been paid to the children’s and teenage libraries resulting in an interactive and stimulating environment. Lighting and colour has been used throughout the library with impact.